Malaysia currently has about 13.6 million Facebook users - this is 48% of the population. It also has the highest Twitter usage in the world. And with such an audience, it is understandable that social media would become an extremely important part of the political sphere. Today youths under the age of 30 [pdf] make up more than 50% of Southeast Asia’s population. This population is mostly middle class, which is a traditional engine of consumption. And in Brunei, Singapore and Malaysia there is an increasing investment in infrastructure and education which creates a high penetration of social media. Even in less affluent countries, like Vietnam, the Philippines and Thailand, low internet penetration rates still mean large numbers of users due to dense urban populations. There has been a mass scale digitisation of the ASEAN countries and in the next few decades this population will adopt more digital services to meet their needs. Apart from digitisation, the other important trend is urbanisation. This will create more access to social media, technology and the internet. The biggest manipulator of online communities in most of South East Asia is the government as it has the largest claim to authority and can exercise censorship. There are two forms of government usage of social media: for political popularity, power and control though censorship; and for development and community building, which of course, does not have to be government led. Many people also use the internet for political change. In the government influence sphere, the Indonesian President Susilo Bambang Yudhoyono, or SBY as he is known, joined Twitter last year. Within two weeks, SBY had over 1.7 million followers and a spike in his popularity. His Malaysian counterpart Prime Minister Najib Razak has been tweeting since 2008. Najib had about 1.3 million fans on his Facebook page, while opposition leader Datuk Seri Anwar Ibrahim has only 428,371. 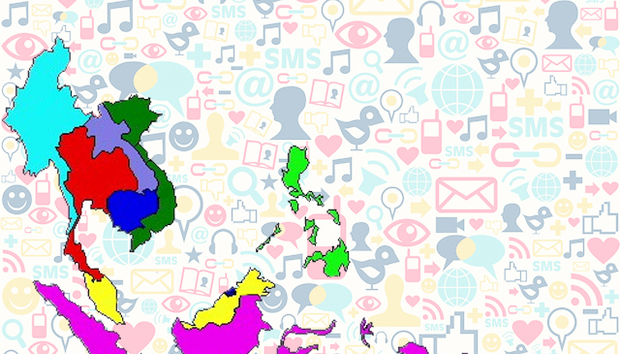 There is a clear correlation between political popularity and social media usage in South East Asia. Although these political strategies might not work so well in poorer countries where people don’t have access to education and internet. The spread of the internet access through smartphones is also enabling political parties to connect with individuals and even entire families that may otherwise be hard to reach. As the smartphone gets cheaper and cheaper so there is penetration of the internet in rural areas as well, especially in Cambodia. The government has been able to use this as a propaganda tool in the same way it uses traditional media, and it has accelerated the adoption of Facebook and other social media platforms. Along with the government, political parties and corporations, the other stakeholders are the people. Sometimes all it takes is one person to shake up the government. In one instance in 2010, Philippine President Benigno Aquino directly answered a Facebook question by a critic. This was unprecedented direct engagement with the masses by a national leader. During the 2011 floods in Thailand, social media was an important tool and surpassed the mainstream media’s efforts in providing emergency relief. Facebook helped build a community around the response to the crisis, providing minute-by-minute information and thus mobilising communities. However, the energy that sustains such online communities tends to dissolve after the crisis is over. Resistance and criticism by the common man is also prone to censorship. In Thailand, Vietnam and Malaysia the government is increasingly emulating China’s example of supressing online freedom. The Technology Crime Suppression Division of the Thai police intends to monitor the country's most popular chat site, Line, which has 15 million users in Thailand. In Vietnam there is the controversial Decree 72 which will enforce bans on posting news articles on blogs or social websites so that the site is used only for “personal” sharing. The government has even made cyber attacks using bots on some bloggers causing them to move their servers outside the country. Thus as much as the internet can offer participation and engagement, a global public sphere is a utopic dream. The internet operates within socio-political structures that influence how the technology and information can be used and disseminated. Additionally, in Vietnam, government agencies are now developing local language alternatives to Facebook and Google. If these services are formally banned these alternatives can fill the vacuum to the benefit of the government. The public sphere of the internet will be co-opted by the government in the future and we may see a confrontation between international technology companies and Vietnamese authorities. In Myanmar, social media has been instrumental in political change for the population. In 2007 videos and pictures of anti-government protests were shared on YouTube and Flickr. This was the only way to publicise tyranny and create external international pressure. The country has been infamous for jailing bloggers, journalists and poets. Yet democratic reforms have led to the unblocking of Facebook, which has become a new ground for political protest. There is a growth of citizen journalism and this has been recognised by mainstream media. In Thailand mainstream media outlets have begun to offer training to citizen journalists. In Malaysia, social media is used to watch trends and mainstream news outlets track sites to pick up news and trends, while international news often uses postings on social media to report stories. The growing popularity of social media is changing how the public perceives official channels of information. Due to enhanced penetration of the internet there is a greater demand for accountability from traditional power. Yet traditional power can still hold the reigns of this information through censorship and information production. Today, like any social system, or any community or society, how social media is used depends on social structure and how traditional political power can balance itself against new types of social power derived from information technology. Only time will tell precisely how this will evolve.